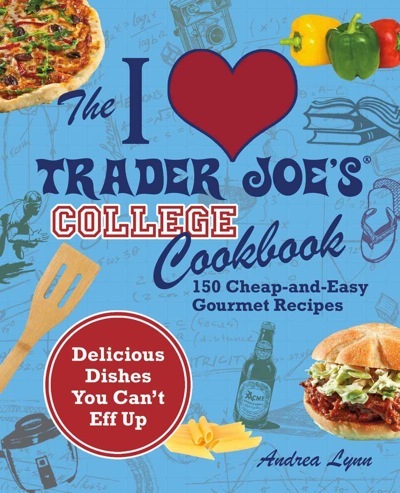 To be perfectly honest, part of me was initially suspicious of The I Love Trader Joe’s College Cookbook… not because I at all doubted my love for the grocery, but rather, because of it. Already being a fan of their orange chicken, or far more often, eating an entire tub of hummus, I thought I didn’t have anything left to learn. It was the part of me that can be a little stubborn, the part of me that back in middle school decided my favorite color would be orange, the part of me that subsequently dyed my adolescent hair an unfortunate version of the color. In short: the part of me that is usually wrong. Andrea Lynn’s cookbook came to me at the perfect time, during the killer heat wave that hit New York in July. I looked at my oven like an old friend who had betrayed me. Why did it make the apartment so hot? Why was it doing this to me after, all we’d shared? A stack of unfulfilling and expensive takeout boxes in the garbage, I would casually stick my head in the freezer and think about how things had come to this. It was a dark place–the kitchen, figuratively, the freezer, literally. The I Love Trader Joe’s College Cookbook was exactly what I needed to get out of my food funk. Written like the twenty-something’s version of Sandra Lee’s Semi-Homemade approach, it features recipes that use about half fresh and half pre-prepared ingredients sold in the store. With chapters on snacks, main courses, drinks, special occasions, and more, it has something for everyone. You’re short on time: I have these great aspirations that I’m always going to cook my breakfast, lunch, dinner, and the many snacks in between from scratch. This is because I am an optimist and also eternally forgetful of the Other Stuff I would also like to be doing. Whether it’s finishing that final paper or making it to a movie, it’s nice to have an option that isn’t a seven-course meal and also isn’t Chinese take out. This week, for example, I made Gazpacho in under 3 minutes. And you know what? My roommates who didn’t have anywhere to be still ate it, so delicious was my chilled soup. You’re short on kitchen equipment: The great thing about Lynn’s half-prepared approach is that a lot of the parts of cooking a meal that require special equipment, such as cooking or blending, have already happened. There is a whole section on main meals you can make in the microwave, and before you say, “I know how to zap a Marie Callenders pot pie, thankyouverymuch,” I would like to offer this counter-argument: Stuffed Red Peppers with Chicken and Orzo. Everyone knows that orzo is the most sophisticated thing one can put in a microwave, so there you go. You’re short on skill: When I first started cooking for myself, the only thing I knew how to make was a quesadilla. Not knowing quite how to proceed from here, the second thing I learned how to cook was grilled cheese. The third thing was an omelet–a huge step, because instead of frying cheese in a carb, I was frying it in and egg. Revolutionary. Point is, when you feel like you’re starting from zero, taking the first few steps towards branching out can be difficult. I’d definitely recommend this book for anyone who feels like they need a set of culinary training wheels. 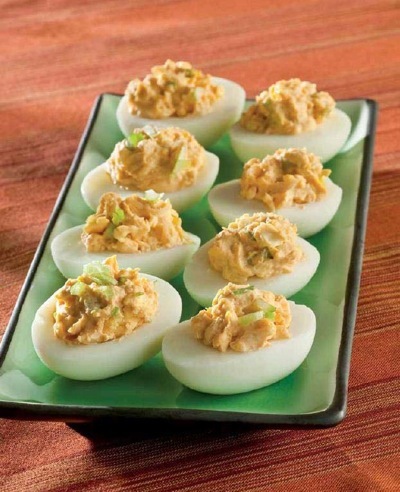 Take the Thai Red Curry Deviled Eggs for those who maybe don’t know how to boil and egg. For the true beginner, the recipe in the book directs you Trader Joe’s hard boiled eggs. If you’re ready for a little more speed, there are instructions on how to boil an egg (or cook al dente pasta, or dice an onion) in the back of the book. As you feel more confident, you can even start to make some of the ingredients you used to buy prepared from scratch. Do you feel the wind in your hair? The sun on your face? Riding this cooking-bike is awesome! Don’t live by a Trader Joe’s? Don’t fear! There are lots of ingredients that can be nearly substituted at most grocery store deli or specialty sections. You could find the ingredients for, say, the Brie and Butternut Squash Quesadillas almost anywhere, for which I think we can all be thankful, wherever we live and wherever our skills are at. Cut each hard-cooked egg in half lengthwise. Scoop the yolks out into a small bowl. Add the mayonnaise, curry sauce, lime juice, scallion, and salt to the bowl with the yolks. Mash the ingredients together until combined. Spoon the yolk mixture into the egg white halves and garnish with a few pieces of scallion. Cook the butternut squash according to the package directions. Transfer to a small bowl and mash with the brown sugar, salt, and pepper. Spread a little brie on each tortilla. Spread the squash mixture on half of each tortilla, then fold the tortillas in half. In a medium non-stick skillet, heat 1 tablespoon oil over medium-high heat until shimmering. Add 1 tortilla, cooking until each side is golden, about 3 minutes per side. Repeat with the remaining tortilla, adding more oil as needed. Remove the quesadillas from the pan and cut each one into 4 wedges. I LOVE LOVE LOVE LOVE LOVE their edamame hummus. Yum. Shopping at Trader Joe’s can be such a problem for my wallet because I leave the store with too many great things! Salsas are just one of those things that I never make, so I love that the all grocery stores have an assortment to choose from, including my new favorite: mango salsa. I’m a sucker for premade torts and dips from the grocery store. TJ and many other stores have a cranberry walnut tort that is to die for. The Thai Vegetable and Thai Shrimp Gyoza (potstickers) are our emergency appetizers. We always have some in the freezer. When unexpected guests drop by, and we LOVE to have friends over, we quickly cook some up, whip up some spicey soy and ginger dipping sauce and we are ready! Oh my goodness the brie and butternut squash quesadillas look AMAZING. I can’t wait to try them – thanks for posting this! Pesto! Its simple to make at home but I’m way too lazy to search for all the pieces to our food processor & clean them. Hummus is something I just can’t seem to get smooth enough, Sabra hummus is awesome and will have to do since there are no Trader Joes’ in Florida and I can’t go often When my family visits California, we make it a point to go but we have to wait until December for our Cat Cookies and dried cherries. PS: I’m a Facebook fan, a subscriber to the newsletter and I facebooked this contest! I think I followed all the required steps! My favorite is the frozen naan at Trader Joes. I’ve made naan before, but it is so easy and surprisingly inexpensive to use their frozen kind. It’s nearly as good as getting it at an Indian restaurant–better than mine! This cookbook would be perfect for me! I just moved out to California (where I discovered Trader Joe’s and I am in love!) and I am struggling to cook for myself while I am short on cash and kitchen space. It’s funny that you mentioned their hummus, because I have made it before, but it never turns out as good as when you buy it! My favorite from Trader’s Joe’s is the pulled pork! But edamame hummus is a close second, so good! I can’t wait to try out this cookbook because next year will be my first year with a kitchen at college and Trader Joe’s is the closest (and best) grocery store to my school. I love the pre-made ravioli (preferably butternut squash), pick up a can of tomato sauce and dinner is made! Pre made humus–just as good as anything Ive ever whipped up in my food processor and way less work involved! I’d say my favorite would be french onion dip to eat with chips. I didn’t realize that Trader Joe’s has edemame hummus but I need to try it. I love Trader Joe’s… though it’s kind of funny that my cousin Joe works at our local one! Rotisserie chicken – already cooked and usually cheaper than raw that you have to mess up the kitchen to make! I love their greek yogurt and whole wheat pizza dough! I love their roasted garlic hummus…soooo good! Love TJ’s frozen turkey meatballs – so easy and delicious! Love TJ’s Frozen Garlic Fries & I like being able to take a premade salad to work, the mango curry one is good & spicy! It is not often that you find a cookbook that has over a couple of receipes that interest you. Trader Joes receipes make you want to try a new one everyday. It is also receipes that you can afford. Thanks for that. I Love their roasted red pepper hummus and also their blue corn tortilla chips! Pre-shredded cheese. Saves tons of work, even though you never quite get the delicious feeling of freshly-shredded. Definitely the chicken pot-stickers. A nice, warm bowl of those, some peanut sauce and a beer? Yes please. I’ve been buying those frozen gnocchi (with sauce) anytime I can find them at TJ’s for what feels like eight years. Now, when they have their fig Greek yogurt (TJ brand), I can’t help but scoop that up too. It’s better than ice cream. I like buying ready made Greek yogurt. I make it myself most of the time, but it’s very convenient to be able to pick some up, ready to go. I had no idea a store sold peeled, hard-boiled eggs before reading your post. Cool! I’d consider buying them too if they weren’t marked up too much. I like buying sushi. Inevitably, when I try to make it myself, it looks like a rolled cigar. And orange chicken; I’ve not been able to make that on my own. This cookbook sounds great! It would be really handy to use at work with my clients who have vision loss. We are always looking for easy to use recipes that they can do. Also for myself I often like to take short cuts at night after work and quick and easy meals are what I am looking for usually. I love to buy premade salads… not of the leafy variety, but things that have beans and chickpeas and rice and tofu and whatnot.